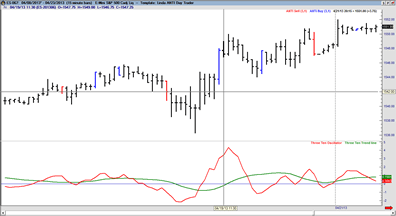 Understand the power of oscillators in any market at any time. Using indicators to help with trading decisions shouldn’t mean searching for and then writing the code needed to create the indicators. The oscillator tools you need for analysis and strategy development are ready to use right out of the box. The Power Plays trading library is your complete trading package with 5 indicators, including 2 unique oscillators, 2 chart templates, 6 highlight bars and 2 strategies. You won’t have to spend countless hours researching and writing code, allowing you to focus on finding trading opportunities. The strategies included in the Power Plays library have been designed to teach you how to use oscillators to make trading decisions and increase profitability. RMO Oscillator -Featured in the October 2003 issue of Active Trader magazine, the “Pretty Good Oscillator” represents the distance of the current close from its X bar moving average. For example, if the PGO Oscillator has a value of 1.5, the current close is 1.5 average day’s range greater than the X bar moving average. PGO Oscillator -Developed by Rahul Mohindar of VIRATECH, the RMO Oscillator was designed to identify bull and bear trends in the markets. 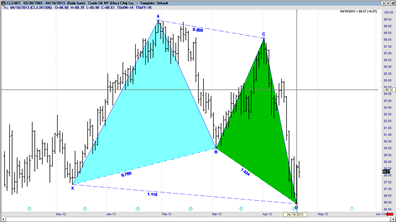 The RMO is an oscillator which identifies whether the market is in a bull or bear trend. 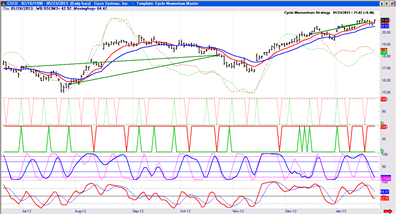 When the RMO Oscillator is above the 0 line, it indicates probable strength. When the RMO Oscillator is below the 0 line, it indicates probable weakness of the trend and puts more weight on short signals. Colored highlights on the PGO will indicate buying and selling opportunities. Of course not all instances are perfect, but with the right market filters alongside the indications, you can make some really Powerful Plays in the market.